The philosophy in learning physics is, on one hand to learn the content of different areas like mechanics, electricity, magnetism, optics, nuclear physics and heat, and on the other hand, to apply these methods in the lab and in demonstrations, to use math in problem-solving and to use models for description (like the field model, the particle model, oscillations and waves etc). With this, the students gain competence in observing and describing in detail, developing ideas for research, drawing and analyzing graphs, taking accurate measurements in lab, evaluating data, drawing conclusions, formulating results, judging results, using tables and formulas, using digital measurement equipment, and studying the text in complex books. All this is done with applications students find in daily life, in nature and technology. The school’s equipment for student labs and demonstrations is marvelous and used intensively. This way students stay motivated, find pleasure in scientific topics and methods, and follow their curiosity. It is hoped that some students will later pursue a study of physics, medicine, engineering, computer science, or related subjects. From time to time, groups of elementary school students are invited to take part in physics presentations of older students. We get notices for free student labs and lectures at the Berlin or Potsdam universities or physics institutions. There is the citywide MINT program through which physics experts can be invited to class. From time to time we have parents come to school and tell students about their daily physics profession. Also, particle physics seminars are sometimes offered by CERN-trained specialists at JFKS. All these events can only take place when the physics preliminaries are laid and the understanding of the students is on a fitting level. 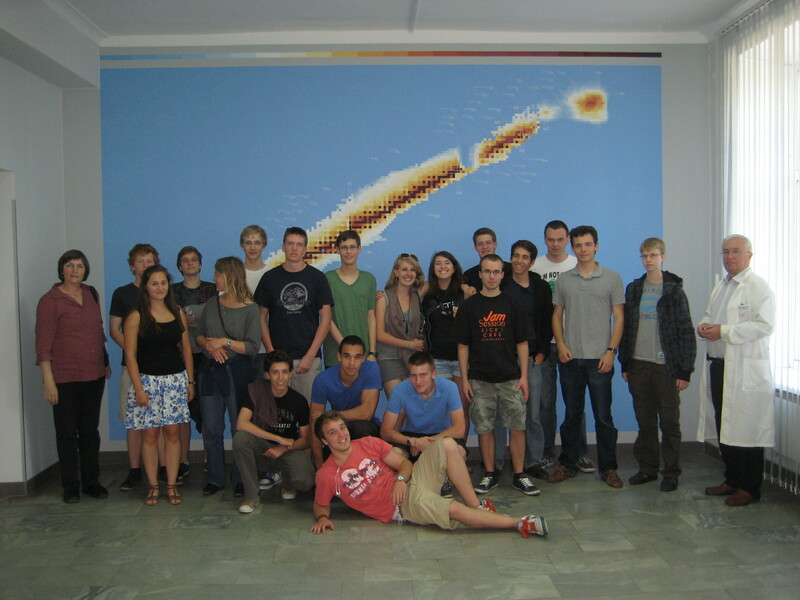 So, for example, visits to the Adlershof Synchrotron only make sense in the very last year of school. Finally, for more than ten years the Leistungskurs has taken a course trip to Russia to visit the Science city of Dubna and the cosmonaut training center of Star City. Another typical JFKS invention is a course section in 7th grade, in which students can learn German language while also doing physics (three hours per week for one semester). Generally three out of six parallel classes are taught in German, three in English – the student groups however are mixed from year to year depending on several school program factors. In classes 7 – 10 the distribution of topics is given by both the Berlin curriculum and the American curriculum with slight modifications. Topics are covered in consecutive years and the insight is deepened from level to level. Normally students have two hours physics instruction per week in these grade levels except for grade 7 (only one semester). Topics in 8th grade: mechanics (velocity; forces; simple machines like pulleys, levers etc. ); Magnetism; electricity (electric charges, field, current, voltage, resistance, effects of the electric current, Ohm’s law); swimming, floating, sinking. Topics in 9th grade: electricity (Kirchhoff’s laws; electric induction, transformers, electric power); optics (lenses); nuclear physics (α- β- and γ-radiation; ionisation; decay; half life time; fission and fusion; nuclear reactors). Students in 11th and 12th grade must decide to follow the Diploma Track or Abitur track. This is a general physics course including all standard topics in a complete general high school physics test, including, motion, mechanics, energy, waves, light, sound, and much more. The class consists of the discussion of ideas, applying ideas in the lab (during a double period each week), using ideas to solve problems mathematically, and applications of physics in nature and technology. The philosophy is “what are the rules of physics and how are they applied in the world?” The course meets for six hours per week. This is an advanced physics course which covers the topics included in the Advanced Placement Physics test, offered each year in May. Students are vigorously prepared with challenging ideas, labs, and problem- solving. Therefore, students taking this course should have ample experience in physics topics as a pre- requisite and a high degree of confidence in applying algebra and trigonometry to problems. The course meets for six hours per week. In physics, the topics in these courses are the same but the level of theoretical treatment is different. The Grundkurs may be chosen as a relevant course in the written or oral Abitur exams whereas the Leistungskurs is one of the two main subjects in the written Abitur exam. In the centralized Abitur exams (since 2015) two out of three offered topics have to be worked on, one of which is a student experiment where the students have to show their practical skills in taking data and evaluating a given problem. The main concepts in these two years are fields (gravitational, electric and magnetic fields and motion of masses or charges in these fields); electromagnetic induction and electromagnetic oscillations and waves; quantums and matter, both of which include atomic and nuclear physics. The students are meant to gain competences in the areas of specialized knowledge (dealing with scientific knowledge competently), of working with the methods of natural science, of communicating in the subject terminology including mathematical tools and presentaion techniques and of reflection of results. All these competences have to be applied in different levels like repeating, applying knowledge on new situations or problem solving thinking.